Freed From Prison, Ethiopian Bloggers Still Can't Leave The Country : Parallels Just before President Obama's visit to Ethiopia last year, jailed bloggers and journalists were suddenly released from prison — a welcome gesture of openness. But their freedom goes only so far. 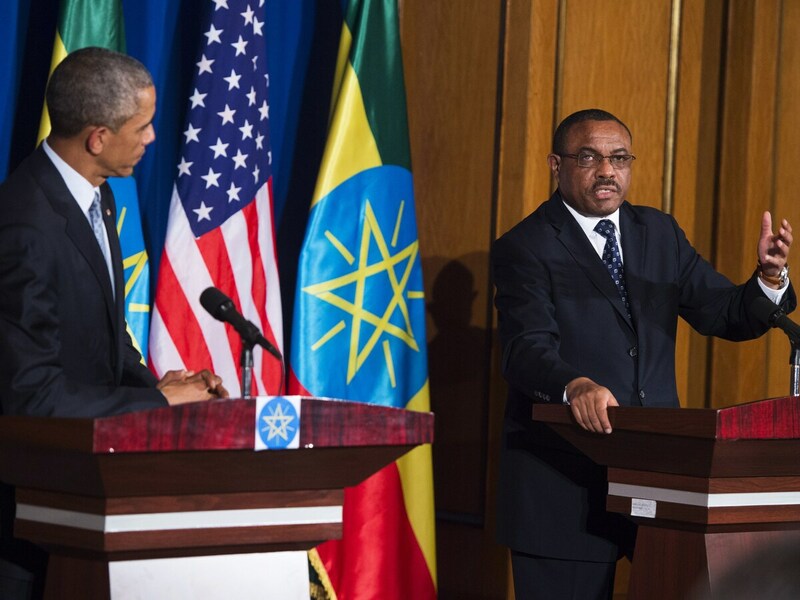 At a 2015 press conference with President Obama in Addis Ababa, Ethiopian Prime Minister Hailemariam Desalegn asked the foreign press corps to "help our journalists to increase their capacity." Zelalem Kibret remembers the day: July 8, 2015. He was in a prison library reading a biography of Malcolm X, his own copy, when some guards called his name and handed him a piece of paper. The message: All charges against him were withdrawn. He was being released. "I was asking why," says Zelalem, a 29-year-old lawyer and blogger. "And nobody was giving us a reason." Zelalem, who'd been in jail for more than a year on terrorism charges related to his blog posts, suspected the reason. His release, he believes, was a "personal gift" to President Obama, then three weeks away from an official visit to Ethiopia, the first ever by a U.S. president. The U.S. had been pushing quietly the release of Zelalem and five other members of Zone 9, his blogging crew. Zone 9 takes its name from the eight zones of the infamous Kality Prison outside Addis Ababa, where political prisoners and journalists are held. Activists joke that the 9th Zone is everything outside the prison walls — the rest of Ethiopia. "Zone 9 is Ethiopia with relative freedom, but still you felt that you are in detention," Zelalem explains. Zelalem and the other Zone 9 bloggers had been critical of corruption and repression by the Ethiopian government, but their blogs and Facebook posts were seen as a relatively safe space for criticism in a country with about 3 percent Internet penetration. But the arrest of six bloggers, including Zelalem, and three other journalists in 2014 sent a signal that as Facebook was becoming more popular in Ethiopia, digital reportage might now become just as censored as print journalism. Journalists are regularly imprisoned under Ethiopia's wide-ranging anti-terrorism law, which makes it a crime to have contact with any group that the Ethiopian government deems is trying to overthrow it. At a press conference during Obama's visit, Prime Minister Hailemariam Desalegn conceded, "We need many young journalists to come up." But, he said, "We need ethical journalism. There is also capacity limitations in journalism." The phrase "capacity limitations" — and its cousin, "capacity building" — came out of development lingo of the 1990s. Ethiopian officials often use "capacity" explanations to assert that journalists are jailed not because they are critical of the government — but because they are less professional, more unethical and more incendiary than Ethiopia's fledgling democracy can tolerate. In keeping with this theme, Hailemariam nodded to Obama's traveling press corps and asked them to "help our journalists to increase their capacity." Obama had offered an opportunity for just that, promoting his Young African Leaders Initiative, which gives scholarships for 1,000 African leaders to study in the U.S. each summer. Zelalem, out of prison but unable to get back his university teaching job, followed Obama's advice. He applied and was accepted to the Young African Leaders Initiative. This summer, he was supposed to study civic leadership at the University of Virginia. He won't be going. Ethiopian immigration officials confiscated his passport at Bole International Airport in November. They also took away the passports of four of his five colleagues who were released in advance of Obama's visit. That's when Zone 9 became more than a metaphor. They were literally imprisoned in their own country. Zelalem sees this as evidence of a new strategy. In past years, Ethiopia has been willing to let its critical citizens flee the country. (For several years, Ethiopia has ranked on or near the top of the list of countries with the most exiled journalists, according to the Committee to Protect Journalists.) Now, Zelalem says, the government may be deciding that it's better to keep critics close by. "Especially for people like us working on social media," Zelalem says. "Whether we are here or in America or somewhere else, we may write and we can reach our audiences. Therefore, it's better to keep [us] here and silence [us]." When I brought up Zelalem's case with Ethiopia's Minister of Communication, Getachew Redda, he said he wasn't familiar with it. But he offered a different explanation for the blogger's rough treatment at the hands of Ethiopian Immigration: Ethiopia's young institutions, he said — including its judges and immigration officials — could zealously overstep their bounds. They could even make mistakes that would take months or years to correct. The minister's solution? "More capacity building." On June 2, Ethiopian authorities returned Zelalem's passport. He arrived in the U.S. in mid-June and is now studying at the University of Virginia for the summer. "It is like walking with the Founding Fathers discussing their dreams for America and else," Zelalem says via email. When he returns to Ethiopia in August, "I will keep on writing with more vigor and empowered knowledge."